Howdy Y'all! 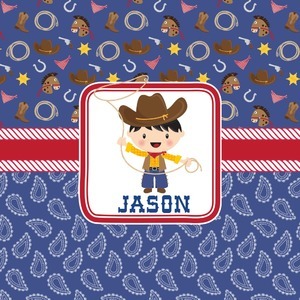 What little country boy wouldn't want to be surrounded by this cute Western theme design? Set on a backdrop of blue, the horses, cowboy boots and hats, rope, guns, Sheriff badges, and bandannas set the scene for a hoedown every day. A coordinating blue paisley pattern on the bottom tie the entire design together. A wide band of red trimmed in rope add that special touch of design. A square label showcasing our cute little cowboy holding his lasso has your little one dreaming of being a cowboy on the range one day. You can customize this design by selecting the boy's hair color and skin color. Name / Text personalization of your choice brings this entire design to life.